United Yacht Sales New Jersey would love to guide you through a personal showing of this 118' Millennium Super Yacht Luxury Raised Pilothouse 2001. 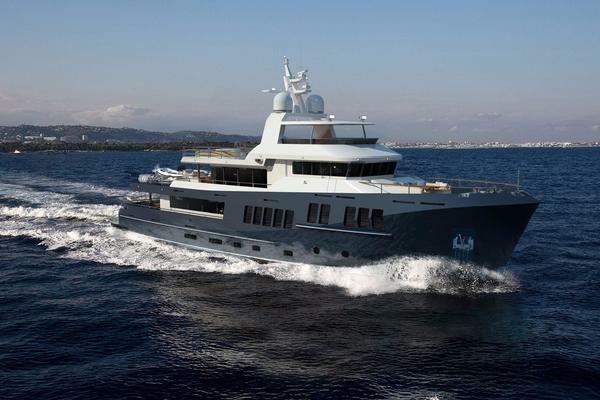 This yacht for sale is located in Palma Spain and priced at $4,600,000. For a showing please contact us by filling out the form on this page and we will get back to you shortly! Standard full-beam layout provides four staterooms in owner’s and guests’ party including a split-level master with full-width dressing room, whirlpool tub and separate shower, a full-beam VIP stateroom, a twin guest stateroom and a queen guest stateroom. Semi-raised pilothouse allows large flying bridge with the tender. Owner customization is anticipated and encouraged. Unique, electrically powered sliding wall panel allows both format dining or informal open-plan country kitchen: full-service wet bars in salon and on flying bridge; hidden large screen Plasma TVs and home theater entertainment systems are available in the salon and master staterooms; all guest accommodations are equipped with separate stereos and televisions; teak aft deck and swim platform. A full suite of communications and navigation electronics installed by Radio Holland. Hull, superstructure, mast, bulkheads and decks are construction of fiberglass on core construction utilizing Core Cell foam and Glass Fiber and Polyester Resins. Main engine primary exhaust is underwater with low speed bypass at the water lineGenerator exhausts are hull side near the water line with mufflers. Chilled water system by Marine Air 3 units, Hein Hoppman 288,000 BTU'sTwo raw water pumps for the chiller systemFresh air exchanger.